Danced by Mikhail Baryshnikov, Cynthia Harvey, Marianna Tcherkassy, Cheryl Yager, and the Corps. Danced by Amanda McKerrow, Robert La Fosse, Johan Renvall, and three Corps. Choreographed by Kenneth Macmillan. Conducted by Alan Barker. Danced by Cynthia Gregory, Fernando Bujones, and the Corps. Recorded at the Metropolitan Opera House, New York, New York, USA, on June 11, 1984. Timings include curtain calls. Your first reaction to this title might be to expect a disk of modern ballet, but as you can see from the program, this is mostly very classical ballet. The newest music was written 90 years ago, and the earliest 80 years before that. The best thing on the disk is the Sylvia. The music is good, some of it quite familiar. These two dancers are, in a word, sensational. They project the image of youthful energy, an utter disdain for gravity, and they do so many pirouettes you�ll be holding on to the arms of your chair to keep from getting dizzy. My age or even much younger, do not try this at home. In Les Sylphides, we see Baryshnikov clearly at his prime, and his partner just as clearly a tiny bit past hers. Originally the ballet was called "Chopiniana" but the title was changed at the first performances in Paris to remind audiences of the ballet La Sylphide (singular) a very popular fairy ballet from 1832 for which the tutu was invented. 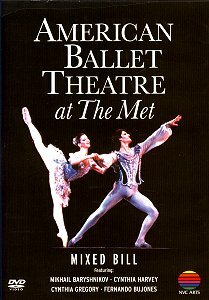 Ironically, most ballets from the earliest times were set to involved plots and often included sung arias and spoken words as well as elaborate sets and stage machinery. For a time the final dance was reserved for the noble audience to join in, at least in courtly procession. What we think of as classical ballet, all dances and no story, is really an invention of the 19th century. The Minkus is great if you like zarzuela music, and the dancers are fine, with Bujones very charismatic and dashing, with flying leaps. However, I don�t really care for ballet quite this classical. After an hour of watching skinny girls in these very conventional costumes performing the same five steps over and over and over again I�m reaching for the fast forward button. For me, ballet began with Tchaikovsky, and in this program only the Prokofiev qualifies. It is the story of two brothers first consoling each other in loneliness, and then competing for the same girl who by her body language could have walked right in off the streets of New York. Is she actually popping her bubble gum? At one point three guys come in and rough everybody up a little bit, but our heroes save the day. Anyway, one brother gets the girl, and the other gets to cry about it. I think the story would have been easier to follow if the two brothers didn�t look so nearly exactly alike, but with identical hair and wearing the same flame pattern red leotards you lose track of who�s who, if it was ever supposed to matter. Even strictly classical ballet is an explicitly sexual entertainment. The obvious Freudian interpretation of a man holding a woman and making her fly can probably go without further discussion. The dancers are almost completely naked, the women with their skirts in the air and their legs as far apart as they can get, the men with their intimate anatomical structure clearly on display. Whatever one�s mindset one does spend a lot of time staring at crotches, perhaps wondering if when the tutu was invented in France did the girls wear any pants. Of course the dancers are rubbing against each other and touching and grabbing each other everywhere. Viewed in this way, the fairy dresses, the extreme Tinker-Bell purity of concept in Les Sylphides is an almost ludicrous Victorianism. Modern ballet which was once considered so shocking is really just a little bit more of the same thing as always, and perhaps more authentic to the origins of the art. Kids reared on films like Crouching Tiger... and The Matrix probably wonder why the girl needs the guy to fly, why doesn�t she just do it, the kids assuming on the evidence of their own eyes that the ability to fly is minimum qualification for becoming an entertainer these days. So take a good look at classical ballet in this 19 year old video; it�s probably an anachronism already and very likely to disappear soon. And a good look is what you get. Picture quality is excellent, very clear, and no NTSC colour jaggies. Some credit must go to the stage designer and lighting engineer as well as to the video director and technicians. Two channel stereo sound quality is quite good, and it will open up nicely in your Dolby surround decoder. Soloists in the orchestra (such as the violin in the Prokofiev) are amplified so they dominate the sound texture.